Betty Anderson, left, was one of the co-founders of what’s now called the WSU College of Nursing with Betty Harrington, right. 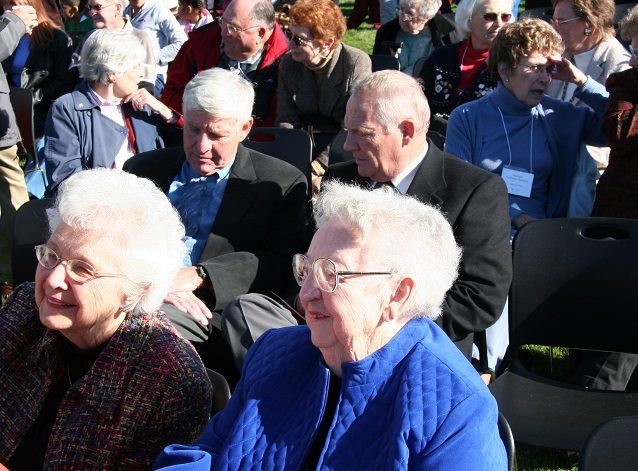 They attended the groundbreaking for the college’s current building in Spokane in 2006. Betty Harrington, one of the founders of WSU’s intercollegiate nursing education program, has died at the age of 95. In the early 1960s, Harrington and other visionary nurse leaders recognized that four-year education programs for nurses would become the standard, so they set about making it happen in Eastern Washington. Harrington chaired a committee in the mid-1960s that brought together nursing directors, hospital administrators, higher-ed representatives and other community stakeholders to talk about creating a baccalaureate nursing education program. Their innovative solution: the nation’s first intercollegiate center for nursing education, which is celebrating its 50th anniversary this year. The program was a consortium of Washington State University, Eastern Washington University, Whitworth University, and Fort Wright College of the Holy Names. WSU administered the program, which accepted its first class of 37 Bachelor of Science in Nursing students in 1969. Initially called the Center for Nursing Education, then ICNE, the program officially became the WSU College of Nursing in 2008. Harrington started working as a nurse at Providence Sacred Heart Hospital in Spokane in 1954. She became director of the hospital-based nursing education program there in 1961. Later, she established Sacred Heart’s educational services department, and worked there until she retired. “Through storms of controversy and times of transition, Betty carried the banner for baccalaureate preparation for nurses,” the Washington State Nurses Association said when inducting her into the state Nurses Hall of Fame in 1996. Harrington died on March 5, 2019. Information on services is in her obituary.